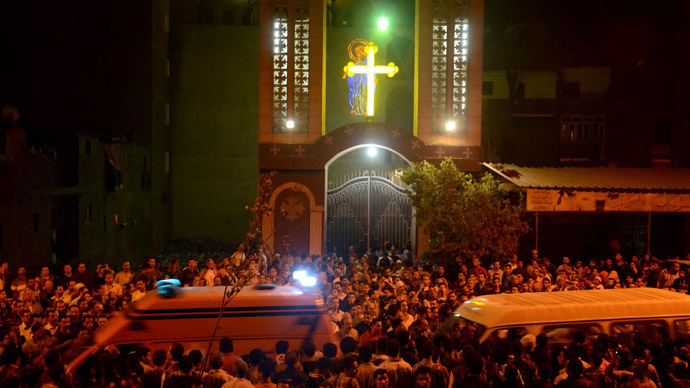 At least three people were killed, including an eight-year-old girl, and around 12 others wounded after unknown gunmen opened fire on wedding guests outside a Coptic Christian church in a suburb of the Egyptian capital on Sunday night. "There were two men on a motorbike and one of them opened fire," said Egypt's interior ministry. The interior ministry confirmed that a man, a woman and an eight-year-old girl were killed in the assault in Warraq neighborhood. Security sources added that it was not immediately clear whether the dead were Christians. Egypt has seen a rise in religious tensions since the overthrow of President Hosni Mubarak in 2011, with violent attacks taking place against the country’s Coptic Christian minority. The minority group has suffered mob violence and attacks on religious buildings. “More than 200 Christian-owned properties were attacked and 43 churches were seriously damaged across the country in the aftermath of events on 14 August,” stated Amnesty. “It is deeply disturbing that the Christian community across Egypt was singled out for revenge attacks over the events in Cairo by some supporters of the deposed president, Mohamed Morsi,” said Amnesty International’s Deputy Director for the Middle East and North Africa, Hassiba Hadj Sahraoui. Copts make up 10 percent of Egypt’s 85 million population and are one of the world’s most ancient Christian communities. They have generally coexisted peacefully with Sunni Muslims for centuries.